Best soccer game apps for Android: go for those goals! The 2018 World Cup soccer championship has started and is already in full swing. In the first days of competition we've already seen unexpected reversals of fortune, last minute goals, pain, tears, joy and much excitement. And since we're celebrating the beautiful game, I thought I'd recommend the top five soccer games available for Android to get into the sporting spirit. The most popular soccer game on the planet. The acclaimed FIFA franchise, created by EA Sports, is also present on Android. In the game, the main objective of the user is to build the perfect cast, the dream team. That means investing many hours in the game, winning games, earning points and like any freemium title, investing a little money here and there if you want to speed up the process. This new edition of FIFA benefits from being able to represent the World Cup officially. So the names, uniforms and stadiums are identical to those in the real-life championship. Of course, in this list we could not leave out the main rival of the FIFA series. PES 2018 is to me the best soccer game for smartphones today with very beautiful graphics and refined easy-to-pick-up gameplay. Without a doubt this great game is a step ahead of its main competitor. This great and addictive soccer game aims to put you in the decisive moments of each game to perform the action. Be it a goal kick, a dribble, a pass or even a header. Create your player and as long as you play well, contracts arise that will lead to the ultimate success of your career as a player. It's easy to play and it will ensure hours of fun. And we could not leave out our selection one of the first mobile football games in history. Real Football has existed since the time of Java phones, a true legend that is present even today in the era of Android smartphones. Produced by Gameloft, it has good gameplay, good visual graphics and can be played without needing to be connected to the internet. 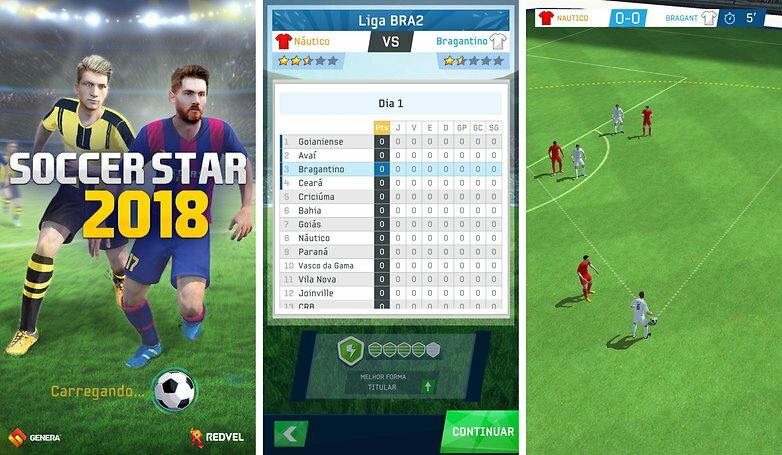 Considered by many to be the best soccer game for Android, Dream League Soccer brought a gameplay proposal very similar to that of PES 2018. With many leagues and game modes available, it is a fantastically fun way to kill time in the subway commute. So, which football game is top of your league table? If you have any favorites that are not on the list, just suggest it below in our comments space.